How to: Make light as air homemade gnocchi with just a few easy ingredients! You’ll never buy store-bought gnocchi again! If making homemade pasta is the equivalent of a 90-minute session of stress-relieving yoga, then making homemade gnocchi is the equivalent of a 60-minute session of stress-relieving yoga – it’s quicker, but the end result is still a prolonged state of pure and utter bliss. It may sound a little strange to equate the feeling of yoga to the feeling I get while making homemade pasta, but hear me out. Both activities require focus. Both activities require some sort of strength and stamina. And both have the ability to take me from high strung to eerily calm in a flash. And while the tranquil feeling I get from doing yoga lingers on well past the class itself, the one thing it doesn’t give me that homemade pasta does? Well, food of course. When I don’t have the time to make pasta from scratch, I find a yoga class I can attend, and when I don’t have the time to make pasta OR do yoga, I turn to gnocchi. It requires less maintenance, is much less fastidious when it comes to achieving the perfect texture, but still relieves any pent up anxiety festering in my head. To achieve the perfect gnocchi, you must begin with a perfect potato, and a perfect recipe. My potato of choice? Russet. My recipe of choice? Lidia Bastianch’s classic gnocchi recipe. For me, the russet potato has the perfect amount of starch, but doesn’t get gummy when combined with flour and egg, unlike other varieties of potatoes. As far as the recipe, while normally I’d try to develop my own, Lidia’s requires no adjustments, and is perfect as written – why mess with a good thing? The one detail Lidia doesn’t have in her cookbook? A step-by-step process on how to make the gnocchi, yes there are very detailed instructions, but I believe that nothing beats actually seeing it for yourself. It kind of demystifies what is often thought to be an overly-complicated process. So I’m going to do something a little different today, and take you through each step of the process. You first need to cook the potato, I like to do it in an extremely large pot, that way the potatoes have room to breathe. Season the water with plenty of salt, and when the potatoes are fork-tender, take them out, peel them and run them through a ricer. 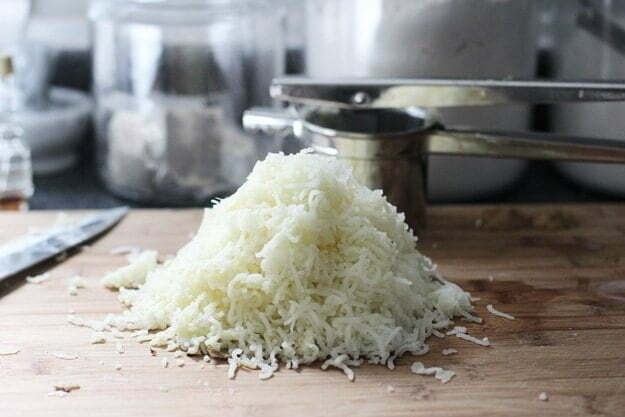 These ricers are pretty cheap, and they not only make the perfect gnocchi, but also make perfect mashed potatoes — I highly recommend having one at your disposal. Next, the potatoes need to cool completely. I let mine set out for about an hour. Now, it’s time to get messy. Start by pouring the eggs over the potatoes…. 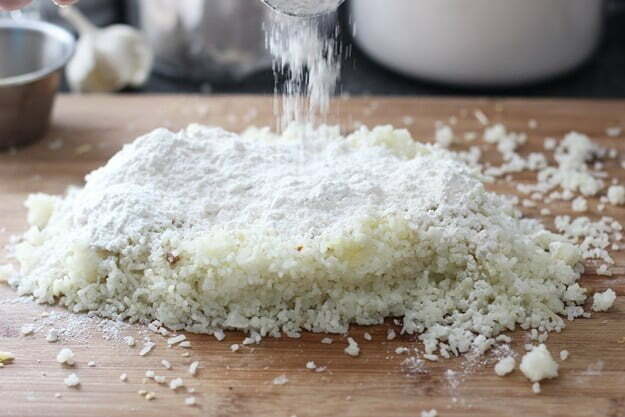 Then sprinkle with one cup of flour…. 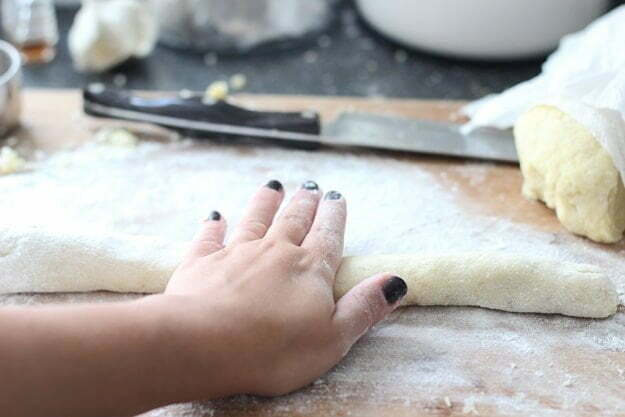 Use your hands to gently bring the dough together…. Until it looks like this. The important thing to remember in this step is to not overwork the dough. 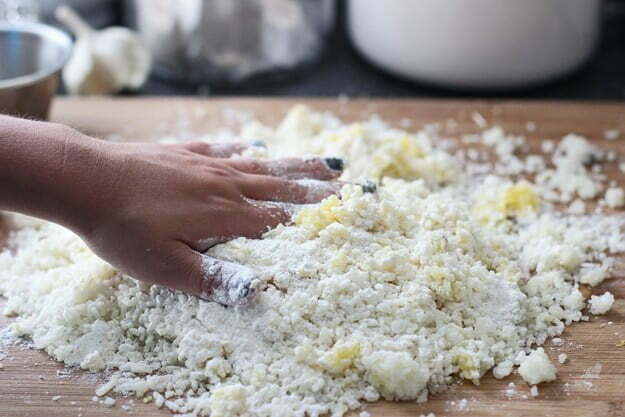 You only want to knead it until it comes together, otherwise your gnocchi will end up really tough. So at this point you’re going to cut your dough into 4-6 sections, and start to roll each section into a rope. I like pretty small gnocchi, so I roll mine out to about a 1/2 inch thick. Using your knife, cut into gnocchi about 1/2 inch thick. Once you press down with the knife the gnocchi will automatically turn into that rectangular shape. Now this is usually the part that trips people up, the indentation is not a science, it doesn’t have to look perfect, heck you don’t even HAVE to do it, and you definitely don’t need a fancy tool. 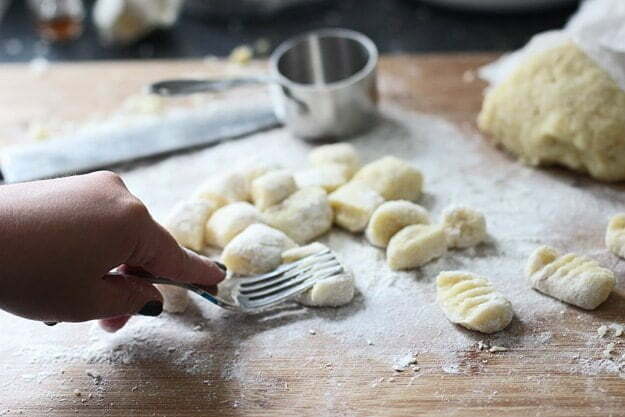 Just use the tines of a fork to put a little indentation on the cut side of the gnocchi and roll the fork forward. Easy peasy. Now you have beautiful, perfect gnocchi ready to be cooked! At this point you want to either cook them right away in a large pot of boiling water, or you can line them up on a baking sheet, pop them in the freezer until they’re solidly frozen and then transport them to an airtight container. These gnocchi are light as air, and so easy to make! Place potatoes in a large pot. Fill with water and 1 tablespoon salt, make sure the potatoes are covered by two to three inches. 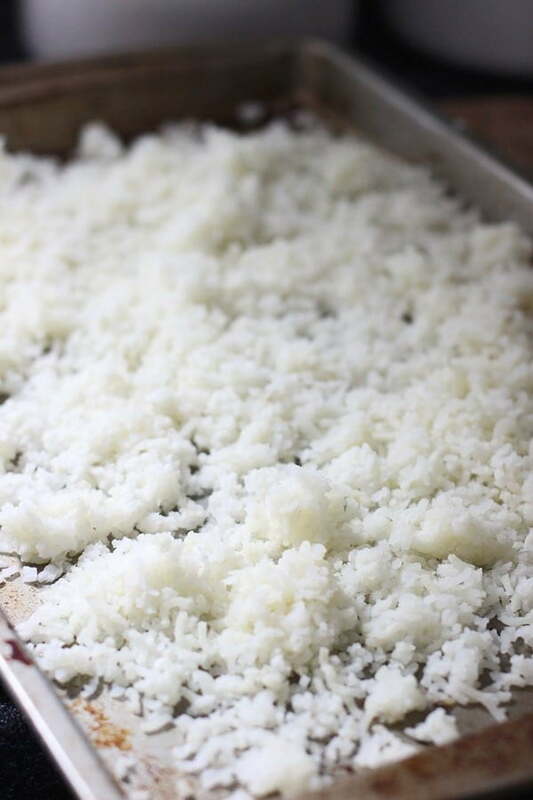 Bring to a boil and then reduce to a medium-high heat, cook until potatoes are soft and can be pierced with a fork. Peel potatoes and half potatoes. Put each half in a ricer, and push potato through. Repeat with the rest of the potatoes. Spread the potatoes out on a baking sheet, sprinkle with salt and cool for 1 hour. Once the potatoes are cool, pile in rectangular mound. Pour eggs over potatoes and sprinkle with 1 cup of flour. Using your hands slowly incorporate all the ingredients. Once all the ingredients are incorporated, gently knead dough until smooth. DO NOT OVERKNEAD. 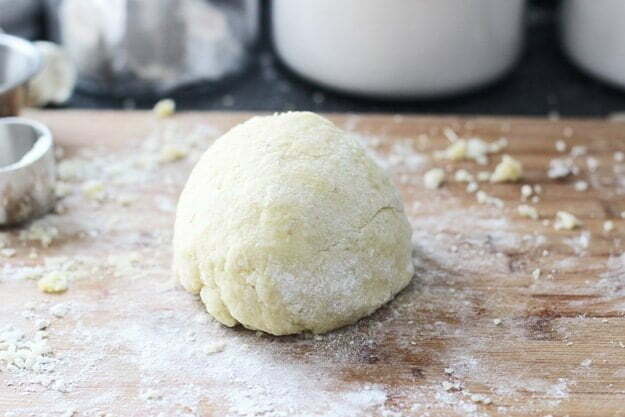 Divide the dough into four quarters. Using your hands, roll each quarter into a rope, about ½ inch thick. Use flour as needed. 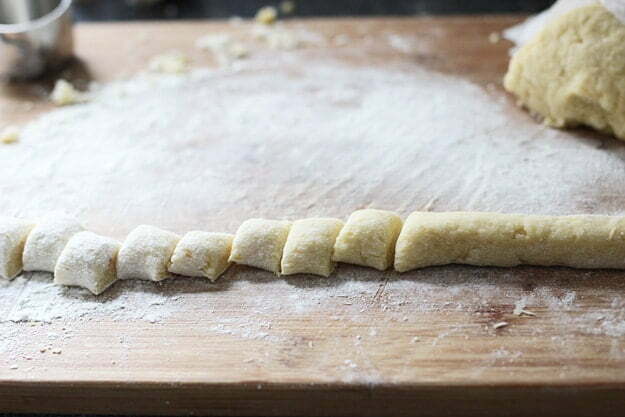 Using a sharp knife, cut into gnocchi, they should be about ½ inch apart. The gnocchi should form a rectangular shape when cut. Using the tines of a fork, place the middle gently on the cut side of the gnocchi and roll forward towards the ends of the tine. To cook the gnocchi: Bring a large pot of water to a boil. Season liberally with salt. Add gnocchi in and cook for 7-8 minutes. Recipe only VERY slightly adapted from Lidia’s Italy cookbook. 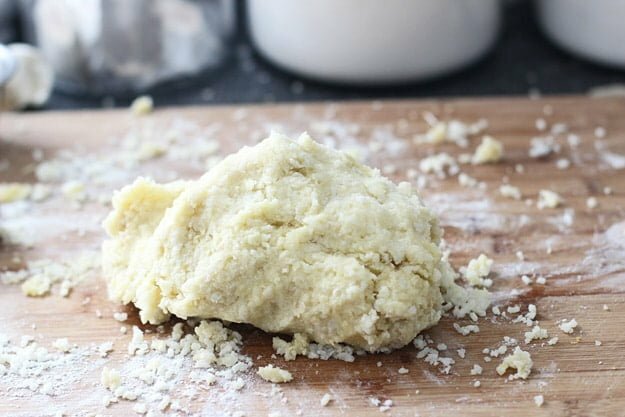 67 Responses to "How to: Make light as air homemade gnocchi"
I love all the photos, you make this whole homemade-gnocchi process seem like something that anyone could do! 🙂 Thanks for sharing truly valuable information! Pinning! Oh yum Nicole: one of my favorites! I love gnocchi, and I’d rather make that than do yoga. haha Can’t wait to see what you do with these! Hahaha. Some days, I would too! Ha! I love the comparison between pasta and yoga for stress relief – that made me smile. I’ve actually never made gnocchi at home … which is just complete and utter craziness. Excited to see what you did with these! It surprised me that you’ve never made gnocchi at home! You must! Well done! We only eat gnocchi when we’re out…but I so want to make it at home! You need to! It’s so easy Monet!! Gnocchi is one of my fav. 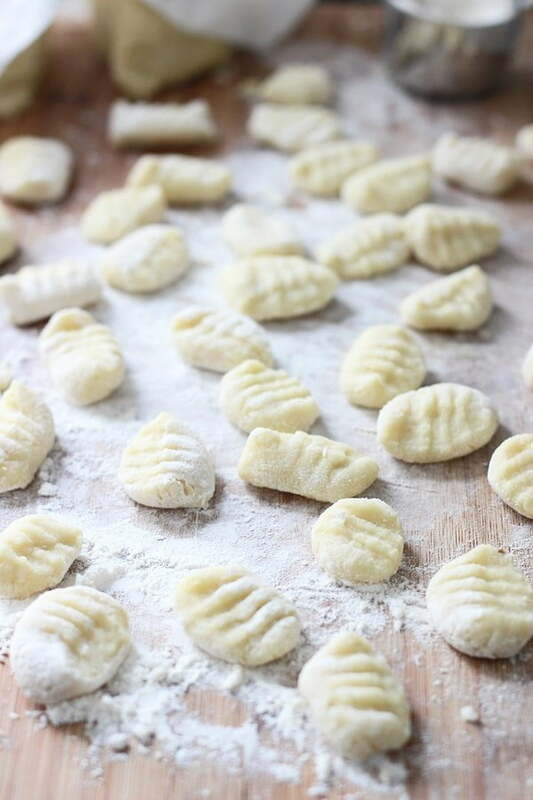 dishes and I love the images to guide us along in the gnocchi making process! When I was a little girl one of my mother’s friends, who was Italian, used to come over and make gnocchi with us! What a wonderful dish 🙂 Gorgeous photos! Nicole, this is so great. I made gnocchi from scratch exactly once, a few years ago, and it was nowhere near “light as air.” More like mushy and yet also kind of tough. I am definitely trying your method! I wish I could take the credit for it! Lidia sure knows what she’s doing! You should try it again with this recipe, it never fails me! Isn’t making gnocchi awesome?! 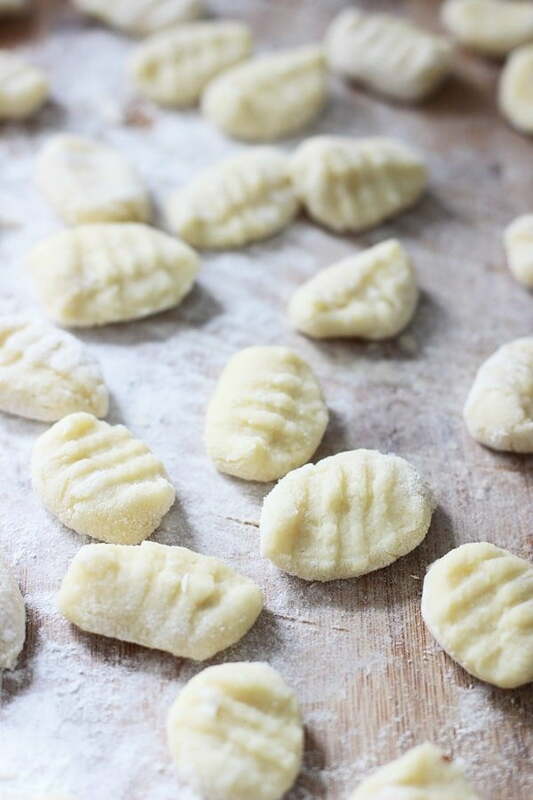 I just posted a recipe for gnocchi on Monday, and it was so calming to whip up the dough and end up with fluffy little potato dumplings! Yours look amazing! Such a fabulous post! I feel like I’m right with you in the kitchen…minus the amazing bowl of gnocchi that I’m wishing would materialize right here! Thanks girly!! These are DEFINITELY not dense!! I wish I could take credit for them though, they’re adapted from the queen of Italian Lidia Bastianch! what lovely gnocchi! There are some recipes that really benefit from step by step instructions and this is definitely one of them. It takes the intimidation level way down. Beautiful!! This recipe is my total love language!!!! YES! I’ve been wanting to make my own gnocchi for years but never have. Love your step by step tutorial! I have never been a huge fan of gnocchi but i think its because I’ve never had it prepared the right way. Love this recipe Nicole. Great recipe, but the cooking time is WAY TOO LONG. Just boil until they float to the top and remove immediately onto foil. Any longer than that = MUSH. hi there! These look amazing! Can you tell me about how many cups of the riced potatoes you would need? Not too sure how much a pound and a half would be and like to have correct measurements for recipes like these!! Any info would be greatly appreciated! Hi Dawn! I would say it was about three cups, but I’d really go by the weight of the potatoes! Hope that helps! Making this now! The ricer I purchased leaves some smashed potatoes in the bottoms of it, should I use those or discard? Maybe I bought a bad river, because yours looks perfect! Sorry for the delay Jessica! 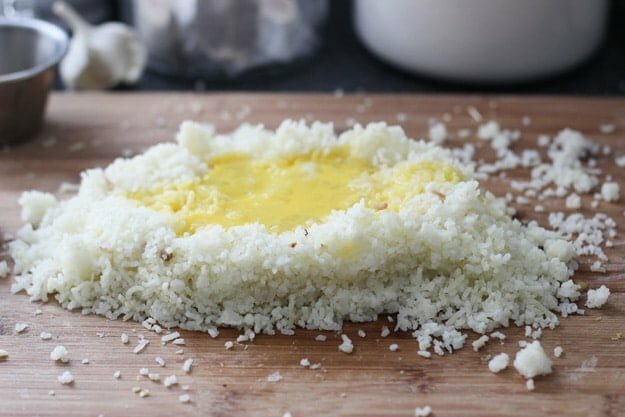 I would not use the whole pieces that are leftover, just try to get as much out of the ricer as possible and then discard the rest! Is a ricer the only method? Any other suggestions for us who don’t own a ricer? No! 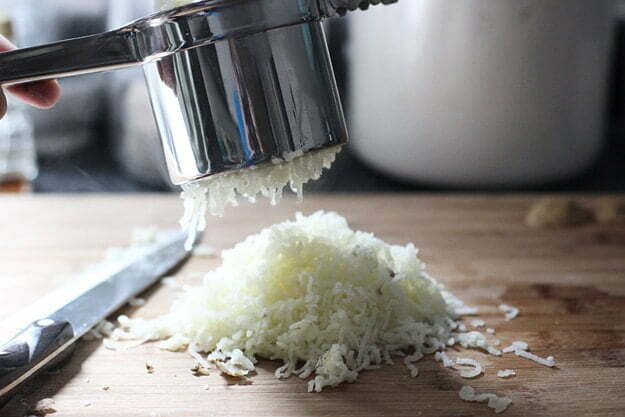 You can also use a cheese grater! Just grate the potato on the large grates and you should get a similar texture. It might not be as smooth, but it should still work. Hi Nicole – Thanks for this wonderful recipe! I used it a few nights ago to make a delicious gnocchi dinner. I loved it so much I just had to share, so I did! A post is up on my blog about my gnocchi experience and I credited you as my source for the recipe. Thanks for sharing! Awesome!!! Thanks so much Allie! So glad you liked it! this looks great but I don’t have a ricer. Can I whip them up instead? So sorry for the delay Megan! I’ve never tried to whip them, but you can grate them on a cheese grater, they won’t be as smooth, but it should still work! Can you store this for future use? I am making some for soup tonight, but wondering if I can make a huge batch and freeze or refrigerate some for another meal later. Yes! Just make it and then freeze before you cook them. I like to spread them out on a baking sheet and pop them into the freezer, then when they’re frozen, transfer them to a freezer baggie or container. How do you cook them from frozen? Same way as they are fresh? Hi Kristen! Yep! They made need a little bit longer to cook through, but just toss them in a pot of boiling, salted water and they should turn out perfect! After boiling potatoes….. you say to peel and half them. Should they be cool when you do this? Or should I peel and half them before boiling? Nope! They should be hot, because they are much easier to peel that way, and you want them to still be hot when you put them through the ricer. You could also peel and half them before boiling, I just find that less moisture gets in when I peel them after. Hope that helps! I can’t wait to make these!! Just wondering…about how much does this recipe make. I am feeding my family of 6 and wondering if I should double. Sorry for the delay Nicole! If you have a family that tends to eat big portions, I would double it! I will have to try this recipe to see if it is as light & fluffy as the ones my mother & father used to make. They didn’t use any eggs. Everything else in the instructions were the same (maybe they had to use a little more flour-not sure) but they were soooo light & fluffy. Had them out in an Italian restaurant one time and they were so heavy you couldn’t eat more than a half dozen or so. Also hear that you can make them out of instant mashed potatoes-want to try that too. Hi Angie! Sorry for the delay, I just mean use a fork to slightly mix the yolk with white, it should still be raw. Hope that help! Hi! If I freeze the gnocchi then do I boil them from a frozen state or thaw then first? And how long do I cook them for? Thanks so much!! They should be cooked frozen, and I say they will cook up in about 4-5 minutes! Can you weigh them at the grocery store? It’s hard to say exactly how many cups it is, a little less than three. So are you really supposed to boil the potatoes whole and unpeeled, then peel them and slice them after they’re cooked?? Yes! It’s just easier to peel the skin off when they’re hot. Just boil them until you can easily pierce the flesh with a knife. The time varies depending on your stove top! Just keep checking them! Wondering if I can substitute the potato with cauliflower and the white flour with almond flour to create a diabetic friendly version. It obviously won’t be the same taste, but a similar texture would suffice. Especially if I made a mushroom sauce to go with it. Not sure if that would work, good luck!! Use ricotta cheese, (drained, wrapped in a towel for several hours), instead of potato.